Just in case you didn’t know, Chris Carter finished the season tied for second in home runs with Giancarlo Stanton. Also in the top five were Nelson Cruz, Mike Trout and Jose Abreu. One of these is obviously not like the others, although Cruz is a cut below Stanton, Trout and Abreu yet still a cut above Carter. We all know that Carter is a one-trick pony (or a three-true outcome pony), but it’s amusing how different he is from the rest of this group when you look at something other than home runs. For example, the three studs in the top five all had a wOBA over .400 for the year while Carter’s was .346. And those three studs all contributed at least 40 offensive runs more than average while Carter contributed just shy of 13 more than average. For the purposes of this column, it’s more important to note that the production of all four other guys in the top five of home runs was essentially worth $30 or more. Carter’s production was worth about $15. To be fair, Carter vastly out-earned the $1 at which I had him valued in the preseason, but this just illustrates how truly limiting the batting average is even when the power production is as good as you can expect it to be. The $15 that Carter ended up being worth ranked 13th among first basemen. In other words, Carter was the best corner infielder in 12-team 5×5 leagues. Again, when Carter hit for as much power as you could reasonably hope for, it still wasn’t enough to make him a “starting” first baseman. It should seem obvious that you shouldn’t pay $15 for him again next year. It’s possible he might have a little more upside in him, but 2014 was probably best case scenario. So don’t pay $15 when the best case scenario is $15 worth of production. But he probably won’t cost $15, and he’s certainly worth more than the buck you had to spend on him this year. Where should he fall between $1-15? There are a couple of numbers that have been trending up for Carter that probably led to the late-season outburst. The first is his fly ball percentage. It took a modest step up from roughly 46 percent to 47 percent last year in his first year with Houston. But in his second year in Houston it spiked up to 51.4 percent. Thankfully the extra fly balls came mostly at the expense of ground balls and not line drives. It seems clear that Carter is making an effort to get the ball in the air more since he moved to Houston. It would be interesting to know how much emphasis the Astros put on that. The second number headed in the right direction is contact percentage on pitches inside the zone. He’s gone from making contact on 73.7 percent of pitches in the zone to 76 percent to 77.8 percent this year. Pitches in the zone are surely easier pitches to hit out of the park, and fly balls are more likely to leave the park. The combination of those two things must be how he went from hitting a home run once every 20 plate appearances to once every 15.5 plate appearances. To keep hitting home runs, Carter will have to keep doing these things. Of the two, putting the ball in the air at a high clip seems like the thing that will be easier to sustain if it’s true that Carter has made an effort to do so and doing so is actually within his control. But while all hitters would like to make more contact on pitches in the zone, putting your mind to doing so isn’t going to be enough to get it done. 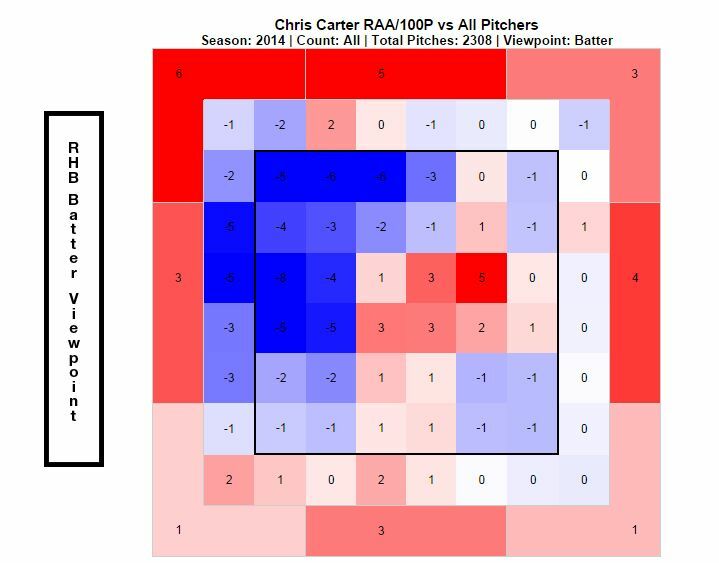 As suggested over at The Crawfish Boxes, Carter did a lot of his late summer damage on pitches down in the zone. But pitchers could adjust and make more of the pitches he sees in the zone be those of the up-and-in variety, where Carter has a hole. That $4 difference is almost entirely that 10 home run gap. It seems hard to believe that Carter would hit fewer than 27 home runs next year given that he hit 29 in 2013. His R and RBI totals would take a dip if he hit fewer home runs, but his 2013 totals were only slightly lower than what they were this year. So if he falls back to 30/64/82 with the same average, he’s worth at least $11, right? If someone wants to pay full price for what he did this year, let them. But if he goes for low double digits, that’s a fair price to pay. We hoped you liked reading Valuing Chris Carter by Brett Talley! He comes with risk. Last year there was talk of him losing playing time because of lack of performance. Also, he is one of those players who can kill you in weekly leagues because you have to keep playing him because he is so streaky. The most likely scenario is he will return value in the low-mid teens. I would pay a few bucks less factoring in the risk, unless my team was starved for power.